Jane Cornwall from Leeds has emailed me to ask if the Ivy growing up a young Oak tree will cause any harm. Firstly, thanks Jane for asking the question and it is a subject we encountered often but I am afraid it does not have a single definitive yes or no. Firstly, Ivy (Hedera helix) is not a parasite and it does not actually live off of the trees resources but merely uses the tree as a support. As Ivy grows it anchors itself using aerial roots and will grow high into the canopy seeking light. Contrary to popular belief Ivy it is not restricting the trees growth at all and will not constrict the trunk or branches. As far as a woodland tree is concerned I would not worry at all as the Ivy is providing habitat and feeding for a variety of birds and of course the Grey Squirrel. If you were to have Ivy growing into an ornamental tree then visually it is a problem and if left to run wild will restrict the light to the trees leaves and cause growth irregularities. Ivy can also be a bit tricky to kill. Sulphate of Ammonia (lawn sand) will work and it pays to cut through the stem with a saw. Make sure you remove at least an inch (25mm) of stem otherwise the plant will 'weld' itself together again. I get a lot of hits on this post from the United States so it seems appropriate that I have come across the Plant Conservation Alliance site that has an extensive write up about Ivy and the ways to control it. simultaneously when I'd finished cutting-through the stem , - the stem on the upper side of the cut sprung away for about 2 ins. One could not push it back in situ, even with great pressure. Therefore the stem had grown & created tension,by itself. growth of the tree is curtailed,because there is a check on the trees physical growth systems. Ivy must check these sytems in the same hysical way. A downside characteristic of ivy on trees is the prospect of the bulk eventually making the tree unstable. Ivy being Evergreen growing on deciduous trees makes the trees highly likely to be blown over in gale force winds, some evidence of this can be seen in many woods up and down the land, hence why the Ivy is often cut especially along roads and other highways. In my job, I have been delivering heating fuel to the rural parts of 11 midlands counties, for 12 hours a day, and for 32 years. I have traveled along literally thousands of lanes, to hundreds of villages (I have the evidence to support this) and I say without reservation that Ivy is detrimental to healthy trees. Every year, in the storms and high winds of the late Autumn, the vast majority of trees, including the healthy looking ones I see fallen, are the ones covered from bottom to top with Ivy. During the Summer, the odd fallen one, is Ivy covered. Other drivers are aware and in agreement with this, and fear for the future of our country lanes. Any single chance I get, the saw, and the secateurs come out, goodbye Ivy, and our woodland heritage gets a breathing space. We need an "Ivy League", to save our Trees, we have "Guerilla Gardners", it's the trees that need our help now. Ivy is not good for trees. Specimen trees should always be kept clear of it. Dying trees near roads or in parks frequented by people should be cleared of Ivy and stablised or cut down. However it would be impracticable to remove all Ivy from all trees, especially in a unfrequented woodland, and any Wildlife Trust would argue that ivy is a vital part of the wildlife hierarchy. Home to bugs which in turn are food for birds nesting in the ivy. Thank goodness there are some sensible comments about the destructive nature of ivy. Yes it is a nectar source for wildlife, so let's allow it to strangle blossom on trees. The ivy doesn't hurt trees brigade are loonies. English Ivy is not native to North America, and there are no checks and balances in the North American ecosystems to prevent it from doing harm. I suspect a lot of the differences of opinion we get are caused by different experience in Europe where it has been around for a long time and native species can handle it better. Thanks for this write up. In support of some of the comments below. Ivy is often recommended to be removed in order to protect specific trees in times of storm and high winds. Slightly differ t point but my neighbours ivy ground and tree cover has taken over our boundary fence to the point of being beyond remedy. Just have to keep trimming back to stop the invasion. Interesting thread. Here in England there is much greater ivy infestation than used to be the case. Roadside trees are festooned with great hawsers of ivy, making them top-heavy, and subject to sail effect in high winds. Inevitably, any question of pruning or ivy removal is pounced upon by the 'nature must have its way' brigade. The result is that stately oaks that have been around since colonial America, are loosing their shape and are having to stretch for light as the invasive ivy branches out into a lightproof canopy. Small trees succumb very swiftly because they don't have the huge root structure to counteract the increased wind pressures. It's all rather sad. Hi, thank you all for your input. I think we should prioritise here and look at the wider picture. Having recently rewatched Al Gore's very inspiring 'Inconvenient Truth', the big issue affecting man (and woman) kind at the moment is the escalating increase in carbon dioxide emissions. So, to me it's a simple choice of protecting as many trees as possible, to absorb as much CO2 as possible, so the ivy has to go. It's not exactly a rare species and I'm afraid the argument for bird habitat has to come in seconnd place. Otherwise it's curtains for us! 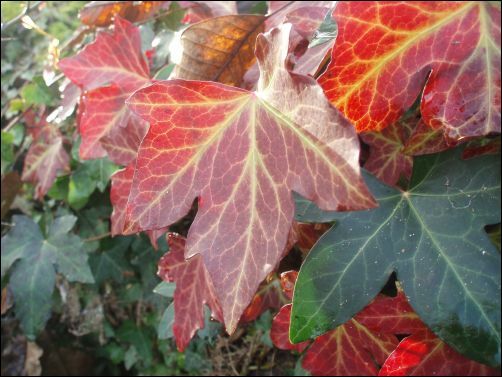 Ivy has been described as having both positive and negative effects on the growth of trees. But I agree that something that hinders the growth of something then it is not good though it has other benefits like food for the birds. All the trees near me are dying from ivy infestation. The damage to the trunks i have seen with my own eyes. They have rotted the bark and they are dying. I was out walking A beautiful summer day on the Tow Path when a tree fell down two feet in front of me. No wind Nothing it fell in a blanket of dust. I looked and it's crown was covered in ivy About ten of the trees own leaves had survived. the Ivy had smothered the tree and it was standing there dead. It must have been the weight of the ivy still growing tipped the weight and pulled it down. Had I left home 2 minutes eariler I would have been under it. I had been watching ivy kill the trees before this happened and wrote to the park I even went to their AGM where I was treated like dirt They insisted ivy doesn't kill trees and the butterflies and bird stuff. . Well its not much use to birds and butterflies if the tree is on the ground before being carried off for fire wood. We must get word out about this creeping death. A few days later I was passing and saw Clarke Cunningham's men cutting this beautiful old Oak tree down. Heartbreaking. I am of course just waiting to see who gets killed by a falling tree . The council used to do ivy as part of manintance I was told but this was stopped, no money. Now someone will pay the price. English ivy *does* cause branch deformation from girdling. Not as bad as from twining vines but it is definitely noticeable and most certainly causes reduced growth. Trees can also be toppled (killed) by the weight of established English ivy.